WestJet has dropped the price of their October flights from Toronto to Vancouver, BC down to $380 CAD roundtrip including taxes. Dates over Thanksgiving are currently available. The number of dates that are cheap AND only have 1 stop each way are really limited, so this will probably be snapped up quickly. Using one of the following departure dates will bring up flights for $366 CAD roundtrip including taxes. Using a departure date of October 6 seems to be the only way to get 1-stop flights. The other departure dates have 2 stops. When you go to actually book it, Google Flights will tell you it's possible to book it for $366 using separate one way tickets. For the extra $14, it's likely worth it to book the ticket as a roundtrip flight for $380. Using one of the following departure dates will bring up flights for $395 CAD roundtrip including taxes. Similarly, using a departure date of October 10 seems to be the only way to get the 1-stop flights for $395. The other departure dates have 2 stops. For that reason the October 6 and 10 departures will likely sell out pretty fast. When you go to actually book it, Google Flights will tell you it's possible to book it for $395 using separate one way tickets. For the extra $14, it's likely worth it to book the ticket as a roundtrip flight. 2. Select your flights and click through from Google Flights to the WestJet website for booking. 3. Use the grid and click on the date combination you're interested in. 4. Click on the orange 'Select' button and click through from Kayak to the WestJet website. toronto, yyz, westjet, flight deals, vancouver, british columbia, canada, yvr, bc and north america. 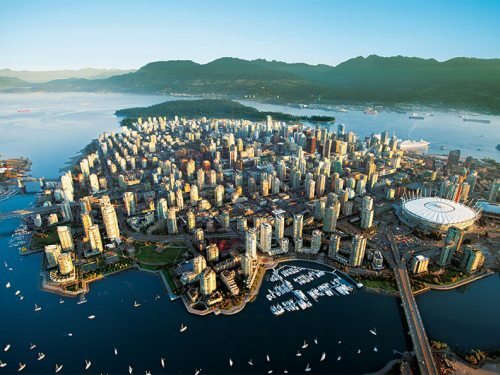 2 Responses to "Toronto to Vancouver, BC - $380 CAD roundtrip including taxes | October and Thanksgiving travel"
Hi is there any deals for November. . Specifically between nov. 17-25?